Montage et scénario : Kamel Chérif. Production : Ariane Lorent pour Métis Productions (Paris). Interprètes : Béchir Neffati, Yolande Moreau, Philippe Khorsand, Kamel Chérif. 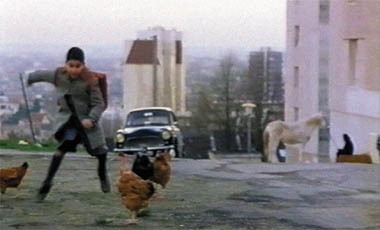 A Tunisian family, who comes to settle in France in the 1960’s, arrives just before Christmas. At school, little Rafik learns about Father Christmas. He tells his family, and everyone awaits their presents in great excitement. But nobody gets any presents, and a vengeful hunt for Father Christmas begins on the waste grounds and around the town.